Scientists have been able to capture and slow light for several years. Slow light, once better understood, could be used to improve devices like sensors and optical communications equipment. Researchers from the University of Twente in the Netherlands, the University of St. Andrews in Scotland, Ghent University in Belgium, and the FOM-Institute for Atomic and Molecular Physics in the Netherlands have moved the field forward with a way to directly observe the phenomenon. The researchers used a photonic crystal waveguide to slow light by several orders of magnitude. The waveguide is constructed of semiconductor material punched with a pattern of holes. The pattern causes lightwaves to interfere with each other enough to slow the pulse to just under one micron per three trillionths of a second, or picoseconds. The pulse traveled about one thousand times slower than the speed of light in a vacuum, which is 299,792,458 meters per second. The pattern in the researchers' photonic crystal channels light from one end of the crystal to the other and briefly traps a portion of a light pulse in an area near the entrance of waveguide. "Intriguingly, it is open on the input and output side and would therefore seem to allow a very easy escape" for the lightwave, said Henkjan Gersen, one of the University of Twente researchers who is now an assistant research professor at the University of Aarhus in Denmark. "Despite its open nature, the structure traps light due to extreme interference effects." Light-trapping ordinarily requires one or more cavities, or tiny echo chambers that capture light by causing it to bounce back and forth. The researchers' waveguide is a 220-nanometer-thick wafer of silicon with 260-nanometer-diameter holes arranged in a hexagonal pattern. A central, solid strip that is as wide as three rows of holes forms the waveguide's channel. The researchers launched infrared pulses lasting 120 millionths of a billionth of a second, and used a time-resolved near-field microscope to observe each pulse throughout its trip through the photonic crystal. Near-field lenses are positioned closer to a sample than the wavelength of the light used and can be used to observe light that remains on the surface of a sample. The microscope has a resolution of 240 nanometers -- small enough to observe details of the shape and position of a light pulse. The method produces images fast enough to yield a handful of frames as the light propagates through the waveguide to capture the motion in a movie. "We demonstrated... that it is possible to directly peek inside a real photonic crystal waveguide... and observe effects that would have otherwise remained hidden," said Gersen. "This [will] help scientists to understand the many fascinating properties of slow light propagation." Knowledge about slow light effects promises to improve sensors. Slowing light allows it to interact longer with its surroundings, giving it more time to react to concentrations of molecules, said Gersen. "Its ability to sense low concentrations of molecules increases," he said. The effects could also be used in optical chips that enable faster telecommunications. "Timing control of optical signals is crucial for increasing data rates and telecommunication," said Gersen. Slow-light photonic crystal structures could lead to a new generation of optical chips, he said. 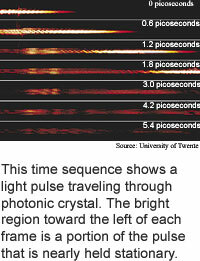 The researchers' waveguide captured about five percent of the energy contained in the light pulse. This must be increased to make the light traps practical, said Gersen. Such devices could be ready for practical use in two to five years, he said. Gersen's research colleagues were T. J. Karle, R. J. P. Engelen, W. Bogaerts, J. P. Korterik, N. F. van Hulst, T. F. Krauss, and L. Kuipers. The work appeared in the February 25, 2005 issue of Physical Review Letters. The research was funded by the University of Twente, the Netherlands Organization for Scientific Research, the European Union and Agilent Technologies.